We may never get to see an Inhumans movie, but Marvel's royal family is still coming to the big screen. ABC is going to air an eight-episode season of Marvel's Inhumans TV series this fall, with the first episodes debuting early in theaters ahead of their network premiere. Now, just ahead of San Diego Comic-Con, ABC has debuted a brand new set of character posters featuring Black Bolt, Medusa and Maximus. 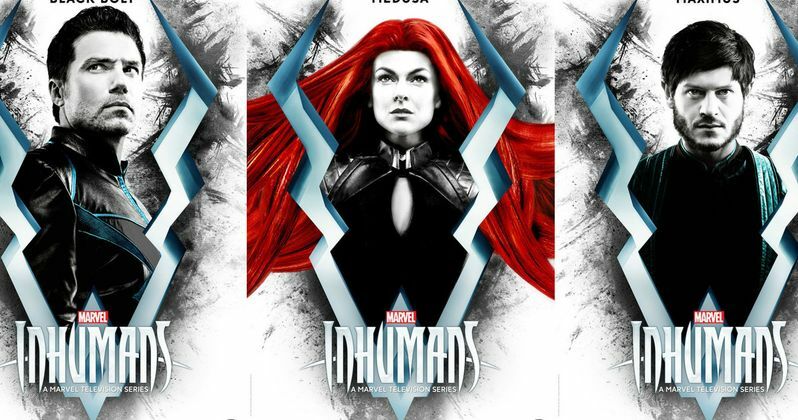 The official Marvel's Inhumans Twitter account debuted the posters, which have the respective Inhumans characters centered on the posters with their names hovering above and the logo and title for the show below. They aren't bad posters, but they may not be enough to win over some fans who have concerns about the series. And there are reasons to be concerned if you are a big fan of the Inhumans. However, since we only have a single trailer to go off of right now, it is a bit early to pass any real judgement. "Black Bolt, Medusa, and Maximus are ready to break out! #Inhumans"
Part of the problem is that the initial marketing materials for Inhumans were a bit, let's say unimpressive. Others might say straight-up bad. The first official image from the show made the characters look like mid-level cosplayers trying to do their best imitation for a convention. Not a high-budget TV show with Marvel's name on it. Medusa's hair looks a bit silly and fans were not happy with Black Bolt's costume. It doesn't help at all that it has already been announced that Black Bolt's classic costume from the comics won't be making an appearance in the Inhumans TV series. Still, ABC seems to be really getting behind the show and, who knows? Maybe it will surprise us all. There are always going to be those fans that want to see what an Inhumans movie would have looked like. Marvel had originally slated their Inhumans movie for 2019 but the movie has since been removed from Marvel Studios' schedule indefinitely. Vin Diesel had also been hinting heavily at possibly playing Black Bolt in the movie, which many fans seemed very excited about. Sadly, that isn't going to happen and the royal family isn't going to be making their way to the MCU anytime soon. Inhumans is something that has an awful lot of potential, but it is also the kind of thing that can come off as pretty cheesy if executed the wrong way. There's a sweet spot in there somewhere. Related: Marvel Says Inhumans Movie Is Still Coming, But When? Inhumans first two episodes are being directed by Roel Reine and were shot in IMAX. The first two episodes of Inhumans will debut in theaters on September 1, which will kick off a two-week theatrical run. ABC will then air the first episode of the eight-episode series on Friday, September 29. Be sure to check out the brand new character posters for yourself below.